Chicago | Reuters — U.S. lean hog futures fell on Tuesday, pressured by weaker prices in cash hog markets and spreading as the market gave back a portion of the steep gains notched on Monday, traders and analysts said. Hog futures on the Chicago Mercantile Exchange on Monday jumped by their three-cent daily price limit in the wake of the announcement of a new trade deal between the U.S. and Mexico, the top importer of U.S. pork. But with Canada entering the trade talks on Tuesday, some hog traders turned more pessimistic about a broader NAFTA deal or a quick ratification of a bilateral U.S.-Mexico deal. In Mexico, tariffs on imports of U.S. pork — imposed last month — remained in place for now. CME October hogs plunged 5.2 per cent, or 2.775 cents, to 52 cents/lb., with some dealers rolling into deferred contracts (all figures US$). December hog futures finished down 0.875 cent, or 1.7 per cent, at 53.35 cents. Hogs in the top cash market in Iowa and Minnesota eased 11 cents to $36.77/cwt, according to the U.S. Department of Agriculture. The CME Group’s index of the U.S. cash hog market is trading at the lowest point since November 2016. 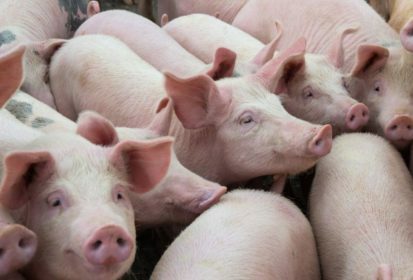 “Lean hog futures rallied sharply on the Mexican trade deal Monday, but that is now replaced by weaker cash reality, similar to cattle,” said INTL FCStone analyst Arlan Suderman. With few signals on how aggressively beef packers would seek to buy cattle this week, CME cattle futures were largely left to follow the hog market. Cattle futures, which posted small gains on Monday, reversed course on Tuesday. CME October live cattle eased 0.4 cent to 107.8 cents/lb. and September feeder cattle declined 1.15 cents to 149.525 cents/lb.